The story behind Starfire Studios is almost as interesting as that of their first game, Fusion: Genesis. Apparently a group of four developers at Rare decided they actually wanted to produce smaller games more quickly than they had at Rare under Microsoft and so they branched out to do their own thing. And so Fusion: Genesis was born: a smaller-scale Xbox Live Arcade title that dares to aim big. Apologies in advance for the long review, but there’s just so much ground to cover. Fusion: Genesis may be a twin-stick shooter, but other than the controls it has little in common with games like Renegade Ops. Instead, it’s closer to classic sci-fi PC RPGs like Star Control and Privateer. After a wittily-written and voiced tutorial in which your abusive scientist mentor is killed, you’re faced with the choice of joining a faction. That decision will affect the next several hours of play, though players can freely switch between factions any time between missions. Fusion’s futuristic civilization consists of five competing factions: the Consortium (traders), Syndicate (pirates), Praetorians (police), Dominion (military), and Revenant Order (obnoxious religious fanatics). Each group has its own outlook and goals which lead them to be neutral and/or hostile to some of the other factions. Behind the scenes, a more alien and sinister race threatens to upset the precarious order of things. The way the game is set up, you can’t not be in a faction. Each one provides its own quest line that reveals a portion of the overall story. Progressing through the quest line unlocks the ability to purchase better ships, which in turn can use better weapons. Ships don’t transfer between factions, so you’ll basically start from square one each time you join a new group, though your credits, weapons, and skills transfer over. That’s the other benefit of factioning up – once you join one, you can spend Faction Skill Points on that group’s unique skills. These include combat maneuvers such as Cloaking, Cloning (which creates a temporary double to fight alongside you), and Teleporting, plus passive abilities like faster Harvesting and increased Cargo capacity. Players are free to spend the points earned from leveling up in one faction on another’s skills and you can’t earn enough points to max out everything, so character customization comes down to preferred playing style. Fusion gives players lots of other choices too – sometimes it feels like too many thanks to the confusing and poorly-arranged menu system. Take the Sentients, for example. These pet-like AI partners fly alongside your ship, zapping enemies and providing all manner of useful support. They come in three basic varieties: DPS (damage dealers), Tanks (defensive), and Healers. To level up a Sentient, feed it crystals gained from harvesting (mining) asteroids. This nets you points to allocate the robot’s abilities, which are either passive or activated by the d-pad during battle. So far so good, but Sentients also have two screens of stats. It’s hard enough to figure out what the stats do since the game doesn’t really tell you and there’s some overlap of names between the two screens. The first screen’s points come from leveling up, while the second screen’s are earned in a much more convoluted manner. You’ll need to mine a bunch of crystals, combine them, and then manually feed them to the little guy to get those points. The Sentient leveling system cries out for streamlining, though you could probably ignore it and still do alright. Sentients also play heavily in Fusion: Sentient, Genesis’s Windows Phone companion game. 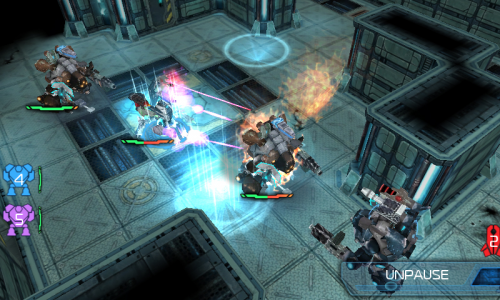 Coming from Wahoo Studios rather than Starfire, Sentient puts players directly in control of a squad of robots in a strategy setting. Since Sentient takes place on the ground instead of space and plays entirely differently than Genesis, it doesn’t feel strongly related to its big brother. The two games do share some connectivity, thankfully. The more powerful sentients that can only be found as rare Ark raid drops in Fusion: Genesis are actually common drops in Sentient. Mobile players can either gift the little robots directly to console players or sell them in Genesis’s Auction House. Thus the Windows Phone game should provide a steady influx of rare and useful Sentients to the XBLA title. For more details and a video demonstration of the two Fusion’ games connectivity, see my article at WPCentral. Page created in 0.8205 seconds.